If you’ve owned a dog for just about any period of time — heck, even for just a few hours — from puppies to full-grown canines, dogs can get absolutely restless if they don’t run around and get moving enough. There’s no doubt that most, if not all breeds of dogs have significantly more stamina than humans. This means that, as a responsible dog owner who wants nothing but the very best for your pup, you should be taking your dog out on a daily basis (even multiple times a day if possible, depending on the breed). Like people, regular exercise offers your dog a number of physical and mental benefits. From endorphin releases to weight management and strength improvements, your dog probably has very positive associations with their leash! Wondering how you can spice up walks with your dog, or are you tired of going to the same dog park, “babysitting” your pet with a watchful eye? Fear not, because Royal Pets Market & Resort is here to offer some useful tips to help satisfy your dog’s seemingly incessant yearning to run around and sniff random things. Our pet market in St. Petersburg carries all sorts of fun pet toys and pet products to help make his or her life — and your life, by extension — better. Royal Pets Market & Resort also offers dog boarding services, dog day camp services to help your dog learn and behave better, and we’re even a full-service pet salon! For pet owners, it really doesn’t get much better than that. Visit here to learn more about our Apopka, St. Petersburg, Palm Harbor, and Carrollwood locations. Now, let’s check out some fun activities that will leave your dog (and you!) euphorically panting in the shade after some vigorous exercise. It might seem a bit silly to let your dog “warm up,” so to speak, but we’re not asking for you to help them stretch their paws. First things first, you’ll want to book appointments with your pet’s veterinarian for complete physical examinations. Why? Well, this is for a number of health reasons, but in the context of exercising safely, it’s primarily to determine their body type, health, medical history, and to discuss any uncharacteristic behaviors that your dog may be exhibiting. For example, maybe your Basset Hound is displaying Retriever-like behavior, urging you to throw the ball so that he or she can fetch it over and over again. Just because your dog is a certain breed doesn’t mean that he or she will act as expected, so pay attention to how they play and communicate with your vet about it. We’ll start out with the basics: Walking your dog. 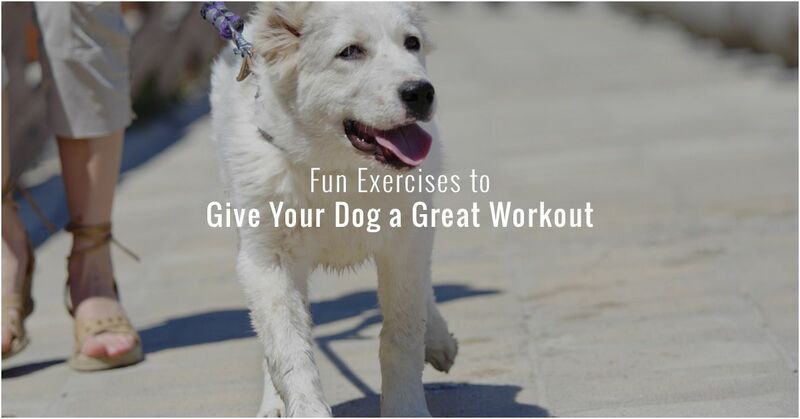 A tried-and-true classic, and a convenient go-to exercise for dog owners around the world, both dogs and owners can appreciate the simplicity and effectiveness of this workout. But is walking your dog really just as simple as securing their leash and heading out the door? Yes and no. The concept itself is very simple, but don’t you want to get the most out of your dog walks? We know that your dog certainly wants that. Depending on your dog’s overall energy levels, begin with walking them for 20-45 (or even more) minutes a day. This should be done at a rather brisk pace. Vary the routes that you take, as this will present your dog with new challenges and scents to explore. Walking on different terrain (i.e. grass, sand, dirt trails, pavement) will help keep the experience fresh for both of you. Also, when you’re out on a walk with your four-legged friend, this is a great time to reinforce basic commands like “sit” or “stay.” Lastly, keep in mind that your dog should always be walking out in front of you or close beside you, not trailing behind. If you notice that your pup is, in fact, trailing behind, consider shortening your walks or just walking at a slower pace. It’s all about being in tune with your pet! Here’s another go-to classic. Not all breeds of dogs are hard-wired to chase a ball —let alone return it back to you — but the majority of dogs will probably go nuts if you throw an object in the distance. Make sure that you’re in a safe area for your dog to be unleashed, like a dog park (dog parks tend to be crowded, so play fetch with caution), your backyard, or somewhere else where he or she won’t run into traffic. Protip: Is your throwing arm shot from those high school glory days of pitching? No worries. Royal Pets Market & Resort in St. Petersburg sells all types of “ball tossers” that perfectly scoop up a tennis ball, allowing you to really hack the ball in the distance while also saving your back in the process. If your dog really enjoys playing fetch and sprinting after the ball at speeds that are literally inhuman, a ball chucker is a wise (and fairly inexpensive) purchase! If you’ve caught the running bug, and your dog has the energy and stamina to keep up with you (Or vice versa! ), why not go on runs with your canine friend? So long as you keep the mileage to a reasonable level, limit direct sun exposure on particularly hot days, and make sure that there’s access to water for you and your pup, you’re both in for a great time. Do bear in mind that your dog is running on their bare paws while you’re probably comfortably gliding around in expensive running shoes. As amusing as running shoes for dogs are (and yes, they exist! ), it might be worth looking into a pair (Or rather, two pairs!). Not only is repeatedly impacting hard pavement and asphalt hard on your dog’s joints, but the road can also get very, very hot — especially during our Florida summers. If you’re an avid runner and you want your dog to run the Iron Dog, keep their comfort and safety in mind. Your dog can’t rightfully just jump into a public pool, per say, but if you have a private pool or access to a doggie pool in town, swimming is a phenomenal form of exercise for your dog. Some breeds might show signs of terror at even looking at a body of water, while others are instinctively bred to hop right in and tread right away. Exercising in the water is particularly great for your dog because there’s no jarring, high-impact component that running or even walking offer. Ideally, make sure that the body of water is relatively clean, and that they wear a canine life preserver just in case. When they’re one step closer to becoming doggie Michael Phelps, you should also rinse them off with water and a dog-safe shampoo. Visit Our Pet Resort In St. Petersburg Today! Regardless of how you and your dog exercise, Royal Pets Market & Resort has what you and your pup need to get your groove on. Come visit our pet resort in St. Petersburg today for dog boarding, pet daycare, pet toys, dog grooming, and so much more!